Fungicides are chemical agents that are used for destroying and inhibiting growth of fungi and fungal spores. The product helps in controlling and prevention of disease and increasing crop productivity. It also improves the storage quality of harvested fruit and products. Few of the examples of fungicides that are available in the market and are efficient are mancozeb, chlorothalonil, metalaxyl, strobilurin and others. Based upon product type, fungicides market has been segmented into mancozeb, chlorothalonil, metalaxyl, strobilurin and others. Strobilurin accounted for major share of fungicides market compared to mancozeb, chlorothalonil and metalaxyl in terms of volume. The product finds major share in the market across the globe followed by chlorothalonil and others. Mancozeb is cheaper compared to other fungicide products and the demand is observed to be high in Europe and Asia Pacific region. Based upon crop type, fungicides market have been segmented into fruits & vegetables, oilseeds & pulses, cereals & grains and others (triazoles and benzimidazoles). Fruits & vegetables are the major crop type for the fungicides market. The fruits & vegetables segment held prominent share of the global market in 2016. Due to rise in per capita income, GDP and disposable income of the people the preference of the consumer has shifted towards consumption of quality food. Production of fruits and vegetable has increased steadily since the beginning of this decade owing to rising demand for fruits and vegetables across the globe. Fruits and vegetables are known to be rich in essential nutrients such as vitamins, minerals and roughage in addition to polyphenols and antioxidants. Fungicides helps in curing and preventing the diseases thus enhancing fruit yield and quality, thus improving the overall plant health in the process. Growing demand for fruits & vegetables and oilseeds & pulses in the Asia Pacific region is contributing to the expansion of agrochemicals, especially fungicides. Rapid technological advancement in the sectors like agriculture and allied industries has highly impacted practices for conventional agriculture of irrigation and fumigation. Asia Pacific region is one of the prominent regions of the global fungicides market. It held major share, in terms of volume, of the global market in 2016. 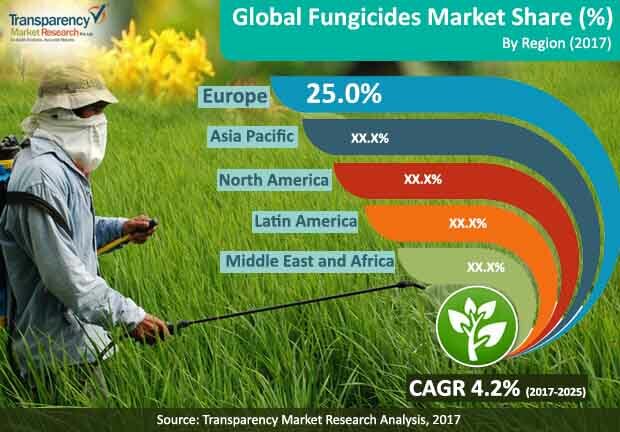 The fungicides market in Asia Pacific is anticipated to expand at a fast pace during the forecast period due to the rise in standard of living and growth in population in the region. Europe and Latin America along with North America follow Asia Pacific. The fungicides market in Middle East & Africa held lower share in 2016. The fungicides market in these regions is estimated to expand at an average pace during the forecast period. Rapid expansion in population has increased food security concerns. Underdeveloped and developing countries still lack proper infrastructure for storage and distribution of food grains and edible agriculture produce. Significant rise in yield is possible through the usage of agrochemicals such as fungicides; therefore, the fungicide market is anticipated to expand at a rapid pace. Governments across the world are promoting the use of agrochemicals such as fungicides to secure food supply for their citizens. Key manufacturers operating in the global fungicides market are BASF SE, Bayer CropScience AG, DowDupont Inc., Syngenta AG and others. The report estimates and forecasts the market on the global, regional, and country levels. The study provides forecast between 2017 and 2025 based on volume (Tons) and revenue (US$ Mn) with 2016 as the base year. The report comprises an exhaustive value chain analysis for each of the product segments. It provides a comprehensive view of the market. Value chain analysis also offers detailed information about value addition at each stage. The study includes drivers and restraints for the fungicides market along with their impact on demand during the forecast period. The study also provides key market indicators affecting the growth of the market. The report analyzes opportunities in the fungicides market on the global and regional level. Drivers, restraints, and opportunities mentioned in the report are justified through quantitative and qualitative data. These have been verified through primary and secondary resources.